Is government doing enough to protect them? Much as they did 100 years ago, farmworkers today still face “back-breaking jobs with impossibly long hours for skinflint wages in filthy conditions,” as a newspaper editorial described it. Wages have not kept pace with inflation, and in some labor camps, living conditions range from the deplorable to the unconscionable. 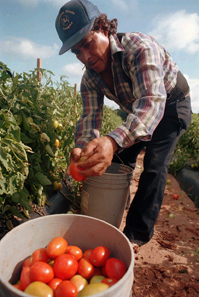 Some farm bosses even have been convicted in recent years of enslaving workers, most of whom are illegal aliens afraid to speak out for fear of deportation. Human-rights advocates say the only way to improve conditions is to give undocumented workers legal residency. But opponents say that would reward illegals for breaking U.S. immigration laws and ultimately spark more illegal immigration. Meanwhile, many state and federal laws protecting workers go unenforced, and growers say Americans increasingly do not want to do farm work.